Pity these containers weren't backpack-friendly. 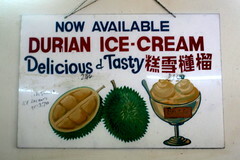 Kek Seng has some of the feel of an old-time soda fountain, to the all-wood booths and the brightly colored come-ons, though the sign below may be more effective on me than on you. 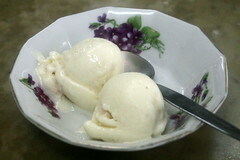 Two very small scoops of slightly grainy durian ice cream (rm 1.20) had less of the infamous pungency and more fruity flavor; the proprietress noted that they made their ice cream in-house, too, using a Malaysian cultivar of durian rather than the familiar Thai monthong.